Still Keep the great work up! The first time I heard the hunters music ,seemed shouting too much, but now that my Western ear has become accustomed, I perceive the environment as a heartbeat that calm me and connect me with earth. The only problem,what I can hear when the tape runs out? thank you for my favourite african music besides haruna. Love the stuff and have this K7 already but thrilled that the good word will spread. donso n'goni is some of the best sound i've ever heard. thanks so much. this is a great cassette. i highly recommend Yoro Sidibe's self titled cd on Yaala Yaala records. most powerful incarnation of this music i've heard. Does anyone have an idea in which year this cassette has been released? @Musiques d'Afrique: I bought the cassette in 1990. 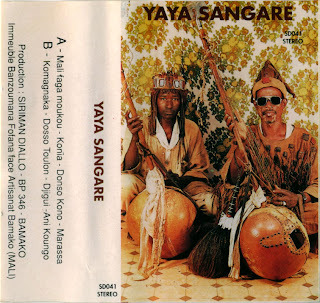 Surely you would like to observe a ceremony with Donso Yaya Sangaré in his most spectacular aspect, we can also recognize other famous hunters like Warabatiato (Seydou Diakité) with his pout and the speaker Zoumana Yoro Traoré asking about the "Marassa"ceremony, etc. To Djimala Yaya Sangare, Madou Sangarë﻿ father. Do not miss the final apotheosis.